Anyway, I thought I'd get more knitting done (I want to make some Christmas gifts) and only got this one mostly completed. It's a cute hat and very easy. I made it from double strands of a lovely alpaca yarn I purchased in Grand Rapids a few weeks ago. 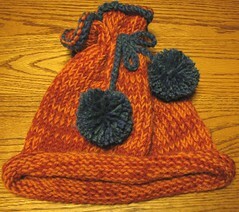 The pattern is from Hip Knit Hats (there are quite a few hats in the book that I'd like to make). Perfect for situations when you don't want to have to think much about what you're knitting.